Operation Overlord which took place on June 6th 1944 (D Day) was the greatest amphibious operation undertaken in the history of war. It involved something in the region of 5,000 ships, 11,000 aircraft and 200,000 men, all intent on the smashing of Hitler's Atlantic Wall and the defeat of Nazi Germany. It involved men from Britain, the Commonwealth and the United States of America. There have been many books written about D Day from a whole range of viewpoints and in many guises. This is just a small addition to that vast number. It is the product of a series of meetings between myself and the four men who have told the story of their experiences before, during, and after that fateful day in June 1944. The four men, Geoff Turner, Ron Picken, Bob Stokes and Geoff Ensor are all members of the Wolverhampton Branch of the Normandy Veterans Association and agreed to participate in the development of this article for the benefit of schools in Wolverhampton. Without their support there is no way the article would ever have been produced. For a variety of reasons the article has taken some time to actually materialise, but I hope the end product does prove useful to schools and others, if possible. I found the meetings with the four men very enjoyable and have nothing but praise and admiration for their fortitude, pride and humour. It is not surprising that with such men, the rigours and hardships of Operation Overlord proved successful and began the final defeat and removal of Hitler's control in France and much of the rest of continental Europe. I hope readers, especially youngsters, find this small volume interesting and valuable. In preparing, this article, I have had a number of meetings with the four men, Geoff T, Ron, Bob and Geoff E. At each of those meetings I have recorded our conversations, so much of what is written in this article is the product of those conversations and the statements made by the four Normandy Veterans. 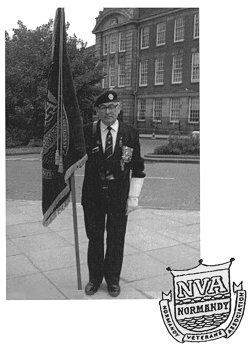 The Normandy Veterans' Association was launched in Britain in April 1981. It was the idea of Arthur Flodman who had landed in Normandy with the Durham Light Infantry. He lived in the Grimsby area and put a paragraph in the local area newspaper which invited local veterans of the Normandy campaign to attend a meeting. That first meeting attracted twenty nine participants. By 1985 Flodman decided to form a national association. At that time there were thirty five branches in the country. The first national president was Flodman's former commanding officer, General John Mogg. Arthur Flodman died a few weeks later. • promote contacts between former comrades via branch meetings, reunions etc. • inform the younger generation of the times and past deeds of their forebears for the benefit of their country. By the mid 1990's the NVA had over 102 branches, not only in Britain, but in Australia, New Zealand, Canada, Belgium and France. Each local branch organises it's own affairs and visits to Normandy. The branches send annual levies, according to the number of members, to the National Council which meets three times a year. The National Council offices are in South Humberside (the area from which Arthur Flodman began the NVA). The Wolverhampton Branch was founded in 1987. Keith Farley died on 18th March, 2010. He was an important local historian who will be sadly missed.